Cartoon found from "Among The Truthers" blog site, by Jonathan Kay. The author of "Leaving Alex Jonestown" and "Swallowing The Camel" has just completed 3 months of interviews, research, investigative reporting laid out on 3 blog sections dedicated to the truth behind the chem trail conspiracies - Her research continues but so far it's looking like those white streaks we've all been seeing up in the sky are probably nothing more than aircraft condensation trails. Conspiracies wreck havoc on the 9/11 Truth Movement. Blame Game: "9/11? He Did It, She Did It, They Did It!" Muslims, George W. Bush, Jews, and or Zionists are responsible for the false flag attacks on 9/11. Fact is there is no conclusive, smoking gun evidence that can connect any of the above mentioned to the attacks of 9/11. 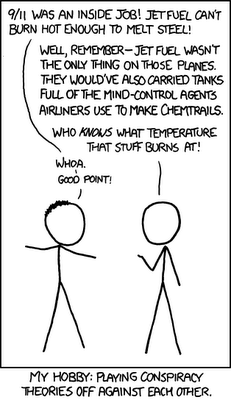 To blame individuals, or whole religions has shown that some 9/11 truthers just like those in governments and corporate media alike, attempt to skip first base for a proper investigation of 9/11 based on the evidence of controlled demolition by researchers and scientists and play the part as judge, jury and hangman with retribution. No real retribution has been pursued by any members of the 9/11 truth movement, but governments, and corporate media have participated in mass retribution by way of war, against the Arab, Muslim communities around the world. The popular mantra of the 9/11 truth movement that has been expressed by many leaders with-in the movement including myself " The 9/11 Truth movement does not claim to know the truth behind the events of 9/11, but seeks to find truth of 9/11". Today 1 in 3 Canadians have doubts about the official story of 9/11 according to CBC, The Fifth Estate. That is why I like so many others in the movement have called religiously for a independent, public investigation into the events of 9/11. Two wrongs don't make a right, so blaming Jews the same way governments and corporate media have recklously blamed Muslims will only set road blocks for activists who seek a proper investigation. I continue today encouraging others in the 9/11 truth movement to adopt a zero tolerance policy against hate. 9/11 Unrelated Conspiracies that have infiltrated and distracted activists away from 9/11 truth. One well known 9/11 truther Wayne Parante, a co-founding member of the popular Vancouver 9/11 Truth movement, and for many the founder of the 9/11 truth movement in Canada, one day with-out warning, walked away from 9/11 truth, to pursue the H1N1 anti flu shot conspiracies. A new conspiracy that posed a greater threat, bigger than 9/11 according to Wayne. Evil governments, big pharma and the NWO (new world order) were all conspiring to kill us all with the new H1N1 flu shot vaccine. Wayne with his inconclusive evidence easily recruited 9/11 activists across Canada, to join him his quest at warning citizens not to take these evil flu shots. Many 9/11 truthers who already didn't trust the government easily jump on board with Wayne's mission to save the world. A few years later, long after the H1N1 flu flourished and later faded away, it was discovered that the flu shots used during the H1N1 epidemic INDEED saved thousands of lives from certain death from this nasty flu! Wayne Parante, along with many other truthers have since removed their 9/11 and H1N1 web sites and have disappeared without trace. 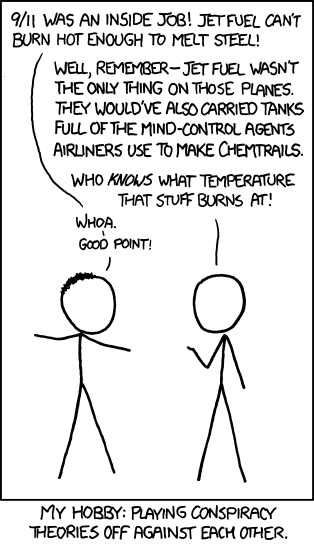 Like the H1N1 caper, conspiracies such as chem trails, fluoridated water and false flag predictions were adopted and later forgotten by many well known 9/11 truthers in Canada. These unrelated conspiracies made it easy for critics like Jonathan Kay, managing editor of the National post, and author of the book" Among The Truthers" to attack anyone who dares question the events of 9/11 as conspiracy theorists, cranks, and 9/11 deniers akin to Holocaust deniers. By our own mistakes of adopting these questionable, inconclusive conspiracies, Kay and his fellow editors and writers at the Post, may have successfully scared off readers from pursuing 9/11 truth, and politicians who would have easily joined the 911 truth movement, our quest for an independent public investigation of 9/11. Every good cause goes through it's growing pains. The truth behind the events of 9/11 will come one day, cause you can't keep a lie alive and the truth hidden for ever. Most humans around the planet already know instinctively the official 911 story is corrupt and full of holes. If the planet is to survive and peace becomes a way of life, the crimes and corruptions of the world must be exposed. The truth about 9/11 will prevail, and neither government, nor corporate media's propaganda, Jonathan Kay, alternative media infowar's inconclusive conspiracies are going to stop the truth about 9/11 from being exposed one day. Closer to home, up close and personal with other conspiracy theorists. "Watering Down 9/11 Truth with Poisonous Tap Water"
Infowar/ We Are Change tries to introduce anti fluoride water conspiracies into Edmonton 9/11 truth actions. May have contributed to the break-up of the Edmonton 9/11 Truth movement.